Love this product because of the natural ingredients. I found the Rose deodorant to be very fragrant with excellent coverage and protection against perspiration issues. I experienced no problems in relation to skin irritation or staining of clothes. It works, has no harmful ingredients and smell delicately of roses. Win. After looking for a healthier alternative to corporate deodorants, I've tried paste, crystals and sprays. There was no joy. The Rose Deodorant roll on is so much easier to apply. The lovely rose smell is not cloying and reminds me of my grandmother, who emanated a soft rose essence all of her life. I live in Texas where it's been grossly hot and humid this summer. I have learned to apply after evening shower and again before dressing in the morning. This keeps me smelling fresh as a...rose. I literally look forward to putting this on every day. It combats under arm odor and smells amazing. Not sticky, no residue, it's perfect. Never needed to reapply midday. This deodorant is pretty decent, I am not fan of the smell though.. The scent is lovely and I have no problems with its effectiveness. The Rose Deodorant is such a beautiful product. It is very gentle on the skin and dries well when applied without being tacky or leaving sticky residue on my clothes. I remain fresh all day long with just a hint of scent. Beautiful scent, gentle in use. Not for sport active people. This deodorant has a lovely smell and is perfect for cooler days, evenings, or light activity. It is gentle, and gives my sensitive under arms reprieve from heaver antiperspirants while still keeping me smelling nice. I've used many natural and/or organic deodorants over the years and very few really work.... this one WORKS and I love, love, love the pure rose fragrance! Regular deodorants dry out my skin, so I was happy to find this. It smells great and it lasts. Good deodorant but i would choose the sage mint over this as I feel like the rose scent doesn't last as long as the sage. It was an effective anti perspirant suggested by my health food store. They said it was the only antiperspirant they had as opposed to a deodorant. I use it rarely because of the over powering aroma and because I need that level of strength only on rare occasions. I'm on my second bottle. Rose deodorant is good - but now having used both types, I prefer the Sage. The Sage formula seems to both work for me better...and by just a hint, has less of a perfume tone. The rose scent of this one isn't too much (I like rose) but overall I prefer the sage one for effectiveness and subtlety. Dries quickly and is very mild, no irritation. Wish odor protection was better.Have to add oils that kill bacteria to deodorant. I love all Dr. Hauschka products including the rose deodorant, the smell is gentle, the texture is pleasant, and application is easy. Very good for cool days but does not hold for very long on hot and humid days. I was looking for a natural deodorant and I found the most perfect one. It is gentle but very effective, and smells so gorgeous! I just love using it every day! Highly recommended!! This Rose Deodorant works great and smells lovely. Even works when I am sweating! Smells lovely!! As this is not an antiperspirant, I reapply throughout the day. HI I was so excited to try this product I cant even tell you. I sweat heavily all day so I was hoping this was the deodorant for me. But I work in a large office and for the last two days I have smelt like BO after the first two hours. Works well for about 3-4 hours only. I have only been using it a few days but so far it is excellent.. I had been looking for something with great ingredients & finally found this. It works all day for me and has a very feminine smell. I've tried them all. At the end of the day this is the only one that leaves me oder free, even when exercising. And on a not to tuff day I still smell like roses! So far so good. My husband is using the sage mint and I use the rose deodorant. We love them both and both are extremely effective. I used a different natural deodorant for the past ten years and it stopped working for me. I am glad I found this product! The Rose scent was too reminiscent of a rose flavoured drink I hated in my childhood. If you could invent an unscented deodarant so it won't clash with my perfume......that would be brilliant. Works great if you apply multiple times a day. I had read good stuff about this product so I was willing to spend the money to buy something that worked. I've been pretty disappointed. I can only go a few hours before needing to re-apply it. I won't be spending the money again. Ok, so I've been using it for about two weeks now. and it's a keeper. I live in South Beach, Florida. I think we deal with the worst weather ever! Anywho, I love this Deodorant it has done the job and oh does it smell wonderful. Thank you for such a beautiful product all around. I hope you guys enjoy it as much as I have. I love the scent of this deodorant. I feel confident wearing it. It works better than most other natural deodorants. I have no complaints. It is a more expensive than other deodorants I have used, but works so much better. 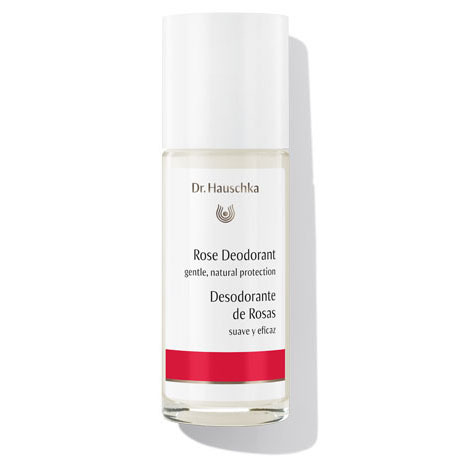 I like the rose deodorant--I have liked many of Dr. Hauschka's products, and ordered this to go with their Body Creams and other Rose products. I have sensitive skin, and the Dr. Hauschka line of products do not cause me any problems. I give them as gifts to my friends. Work great and love the fragrance. Very expensive with the shipping. Not sure if I will order again because of cost. love the smell and texture! Since It's natural, you need to reapply often. Under most conditions the product works well and has a nice fragrance, but didnt pass the tennis playing test in 85 degree weather. Will use under normal conditions. Forget about drug store brand deodorant, this stuff is amazing! Recently purchased an extra bottle for my daughter to try and she loves it as well. A bit more expensive but definitely worth it. A bottle can easily last up to 6 mos. for me. You are always "smelling like a rose"! It's great, nothing toxic, and it actually works. The others never do anything. The fact it is Rose is a bonus. Everything should smell like roses! I love this! I have literally tried every possible natural deodorant that I can get my hands on, and even made several homemade ones. None of them work as well as this one. Some of them even make me smell WORSE. You do have to remember - this is not an antiperspirant. You are still going to sweat (which is better for you anyway, I think). It is just meant to keep you smelling good. For me it delivers on that very well, and lasts all day without reapplying. Yes it is pricier than many, but if it works it is well worth it to me. It is difficult to find in stores, so I usually order a couple at a time online. Water (Aqua), Simmondsia Chinensis (Jojoba) Seed Oil, Alcohol, Manihot Utilissima (Tapioca) Starch, Glycerin, Zinc Ricinoleate, Ricinus Communis (Castor) Seed Oil, Glyceryl Caprylate, Rosa Damascena Flower Water, Rosa Damascena Flower Oil, Fragrance (Parfum), Citronellol*, Linalool*, Geraniol*, Eugenol*, Limonene*, Farnesol*, Citral*, Benzyl Alcohol*, Alchemilla Vulgaris Extract, Cetearyl Alcohol, Cetearyl Glucoside, Hectorite, Xanthan Gum. Silk Body Powder supports the skin’s healthy pH balance and absorbs perspiration, naturally helping to neutralize odors. Rose Nurturing Body Wash is soap-free and gentle and smooth enough to be used as a moisturizing shaving cream.